Germanna Community College engineering students took a first place for a multi-rotor copter design at the American Society of Mechanical Engineers' Student Competition and Conference at Drexel University in Philadelphia Saturday. Germanna's winning multi-rotor copter in a night shot at the Fredericksburg Area Campus in Spotsylvania. "GCC students Reuben Strangelove, Andy Fabian, Zach Yee and Ethan Fiore created the winning copter design. Over 180 students from 20 institutions competed. 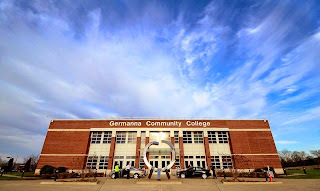 Germanna was the only community college to participate and bested Drexel, Yale, the University of Massachusetts - Lowell, Rochester Institute of Technology, Temple and other universities. Winning Germanna engineering design team members Reuben Strangelove, Andy Fabian, Zach Yee and Ethan Fiore. "We are very excited to share that we won first place in the Student Design Competition for our multi-rotor copter," said Germanna Engineering Prof. Davyda Hammond "This award is the most prestigious given at the competition." 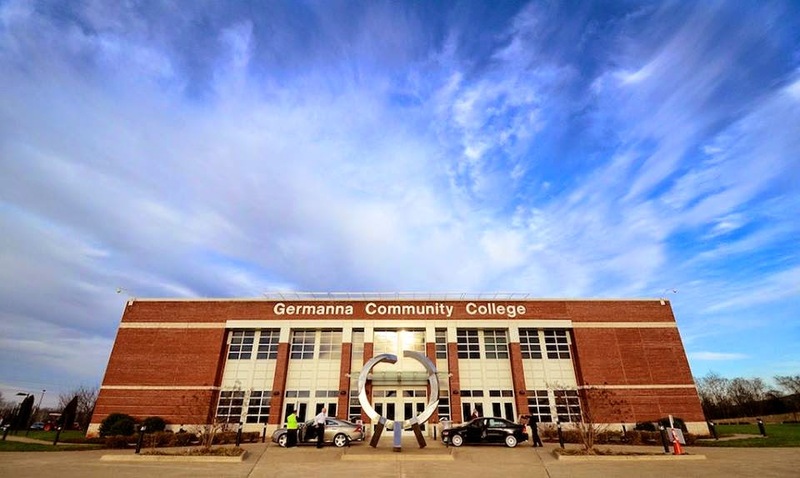 Germanna earned a slot in the final competition to be held in November at the 2014 International Mechanical Engineering Congress & Exposition in Montreal. Two Germanna students, Charles DeLorenzo and Jade Thompson, also took second and third places in the Engineering Website Competition. 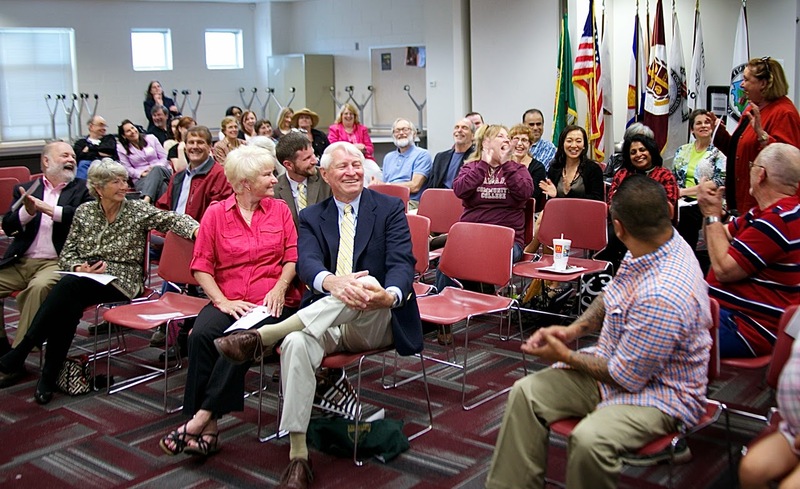 Two Germanna Community College professors were recognized with emeritus status during a retiree reception at the Fredericksburg Area Campus in Spotsylvania Friday afternoon. 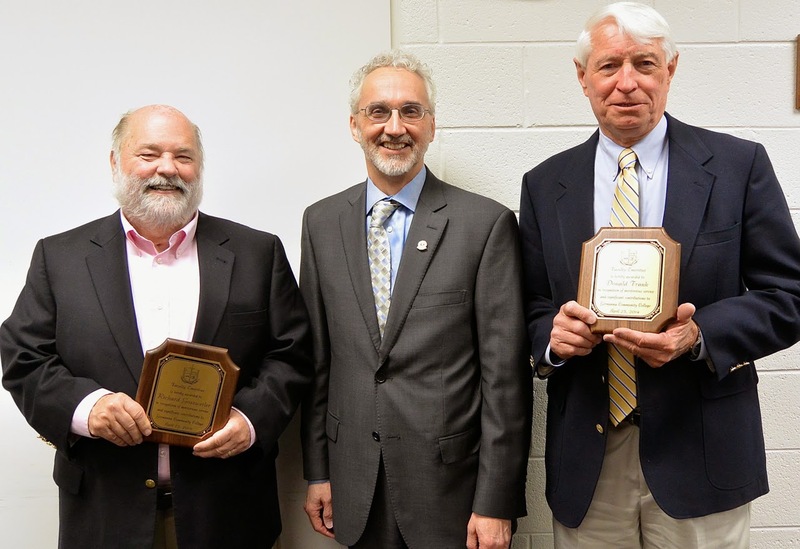 Rich Gossweiler and Don Frank were awarded professor emeritus status. Gossweiler, it was noted, not only taught students, but mentored faculty and staff. Prof. Cory MacLauchlin said of Gossweiler: “When I first came, there was one line that Rich said that stuck with me. “To me that’s your legacy,” MacLauchlin said. Gossweiler will continue to teach at GCC on a part-time basis. Also honored were retiring staffers Joy Paxton-Collis (10 years) and Gail Banks (15 years). At today’s anniversary celebration of Joining Forces, First Lady Michelle Obama and Dr. Jill Biden announced the launch of a new integrated employment tool to connect veterans and service members with employers, and to help translate military skills into the civilian workforce. The Veterans Employment Center, an integrated, online tool connecting veterans, transitioning service members and their spouses with both public and private-sector employers, is the result of an interagency effort to improve, simplify and consolidate the current array of employment resources for veterans. Additionally, this will provide one comprehensive database of resumes for employers who are seeking to leverage the skills and talents of veterans, service members, and their spouses. The new online resource, called the Veterans Employment Center, is the first interagency tool to bring a wealth of public and private job opportunities, a resume-builder, military skills translator and detailed career and training resources together in one place. In connection with the First Lady and Dr. Biden’s Joining Forces initiative, the Department of Veterans Affairs worked with employers, the Departments of Defense, Labor, Education, and the Office of Personnel Management to design and develop the site and incorporate features of existing online employment tools within government. 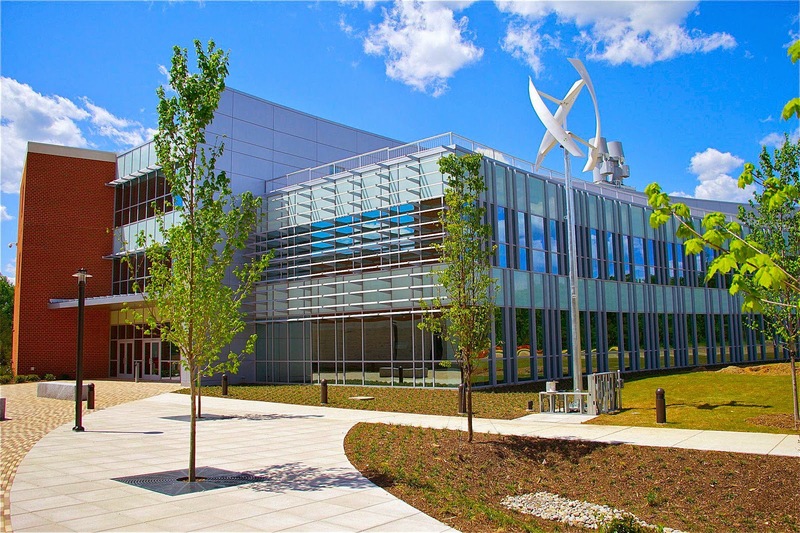 The result is an integrated solution providing veterans, transitioning service members, and military spouses with the tools they need to connect to employers. With this tool, employers will be able to search and view Veteran, Service Member, and spouse resumes in one comprehensive location. "Our service members transitioning to civilian life, as well as their spouses, deserve the resources they need to be successful," said Secretary of Defense Chuck Hagel. "Through this effort, they are getting that help. Our troops and their spouses are proven leaders, highly-skilled and hard-working. Employers hiring them are getting the best this nation has to offer." The Veterans Employment Center will provide employers with access to a targeted pool of resumes from veterans and transitioning service members, allowing them to search resumes to identify veterans with skill sets applicable to civilian employment at their organization, and to track progress towards reaching their veteran hiring goals. Resumes are visible to all employers with an active LinkedIn or Google profile. To prevent spam, an applicant’s name and email address are redacted and only visible to employers verified by the VA as registered companies with the IRS. The site is also built using open data and an open application programming interface to attract private-sector innovation. Joining Forces is a national initiative launched by First Lady Michelle Obama and Dr. Biden to engage all sectors of society to give our service members and their families the opportunities and support they have earned. In addition, Dr. Biden launched the Military Spouse Employment Partnership in June 2011 with just under 60 companies. Today, Dr. Biden announced there are 228 partner employers, more than 1.8 million jobs posted on the MSEP Career Portal and more than 60,000 military spouse hires. The Veterans Employment Center can be found here. 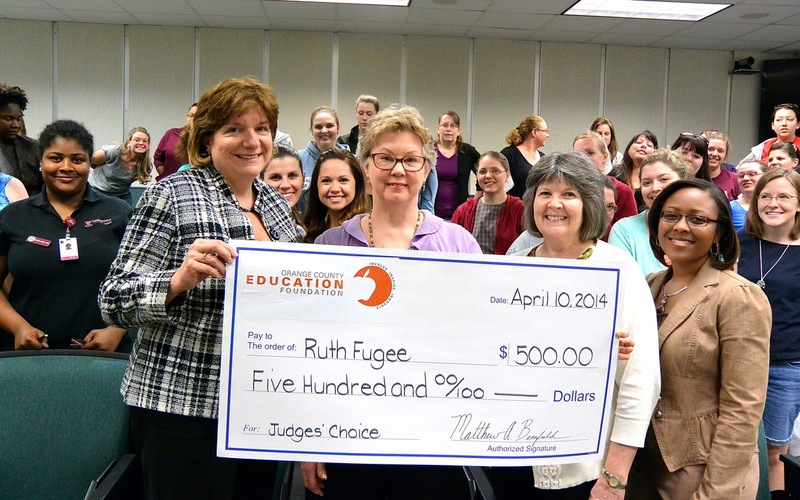 Germanna Community College nursing faculty member Ruth Fugee has been awarded a $500 Judge’s Choice Teacher Innovation Grant from the Orange County Education Foundation for a "GCC Nursing Program Long-Term Care" project. Pictured with her are Dean of Nursing Patti Lisk, nursing faculty members Debbie VanNortwick and April Morgan and Germanna nursing students. GCC faculty members Leigh Hancock and Sunithi Gnanadoss received a $250 OCEF Teacher Innovation Grant to fund a project called "Follow your Dreams and Lead by Example." Germanna Community College students Dayana Pachon Ramos, Stefano Sarris, Jennifer Baggett and Christine Chester were honored this week at a luncheon at the Omni Richmond Hotel as members of the 2014 Phi Theta Kappa All-Virginia Academic Team. Sarris has also been named a Silver Scholar on Coca-Cola's 2014 All-USA Community College Academic Team. The program is sponsored by the Coca-Cola Scholars Foundation and administered by the Phi Theta Kappa Honor Society. His selection was based on the score he earned in the All-USA Community College Academic Team competition, competing against a national field of 1,700. He'll receive a silver medallion and a check for $1,250 next week at the national PTK convention in Orlando. Sarris will earn his associate's degree from GCC in May and transfer to Cornell University in the fall, where he will study environmental science. At Germanna, he received an Atlantic Builders scholarship from CEO Adam Fried and the Germanna Educational Foundation. Monique Lewis, a Germanna faculty member and PTK advisor, said Sarris "epitomizes the diverse student body found at GCC. Our students have unique stories and overcome great odds to become successful. His drive is awe inspiring." t was a dissection of sorts. A big-screen TV, a vintage computer, a laptop, a microwave, cell phones, prrinters, scanners, radios, motors, pumps, electrical swtiches, relays and other devices and gadgets were autopsied. Germanna Prof. Mirela Fetea with a young deconstructor. Profs. Mirela Fetea and Davyda Hammond held the event Wednesday night at the Science & Engineering Building and Information Commons on the Fredericksburg Area Campus in Spotsylvania. About 60 people age 3 – 70, in some cases entire families, participated. "Activities like Deconstruction Night build communities of learners and camaraderie among faculty and students already in the program, their friends, families, and outside visitors of all ages eager to learn," Dr. Mirela said. "We have a great group of dedicated and enthusiastic physics and engineering students at Germanna, excellent ambassadors to instill a deeper appreciation of what physics and engineering are all about, she said. "Many people think that science, technology, engineering, and mathematics, in particular physics and engineering, are challenging. They are. But they are also fun, exciting, practical, and extremely relevant to our lives." In 1941, when he was 11, the Germans marched into his town of Lvov, Poland. The soldiers were good-looking young men,” Holocaust survivor Mark Strauss told a history class taught by Marijayne Kruus at Germanna Community College’s Stafford Center at Aquia Wednesday afternoon. Their shirt sleeves were rolled up, revealing tanned, muscular arms, recalled Strauss, an 83-year-old artist and author who has taught at Georgetown University and Northern Virginia Community College and now lives near Woodstock, Va.
Their morale impressed the young Jewish boy. Soon the boy watched the happy, handsome Nazis stomp one of his neighbors to death. Hitler’s “master race,” Strauss said, was “supposed to be blond, handsome and brave." In Hitler’s mind, Jewish people, homosexuals, the mentally and physically disabled, “would pollute the master race,” Strauss told the students. Strauss said that within a year’s time, most of the Jewish people in Lvov were murdered—about 100,000. There was no concentration camp in Lvov, he said. “A lot of luck,” he said. One day he was in the family apartment with his mother while his father was at his job as a roofer. He said hired goons then tore the wallpaper off the wall in the apartment and cut the mattresses looking for money. “The Germans [didn’t] do the robbing,” he said. “They’re the master race. They have flunkies do that for them. Books were slammed about the apartment until a Nazi SS officer found a photo album. Strauss’ father had been a Polish army officer during the Bolshevik War. The SS officer stopped cold when he found a picture of him in uniform. He said they then kept going “until their quota of Jews was in those trucks and those Jews were murdered. He said the vast majority of the Jewish people in his town were killed. One day he watched a Jewish man from the apartment house across the street being brutally beaten. “He was stomped to death on the sidewalk,” Strauss said. Germanna students look at Mark Strauss' art--some of it inspired by his Holocaust experience. The Jewish people of the town were herded into a ghetto, he said. His family was among 20 people living in one room. “They can still come and take people,” he said. “But now they can kill Jews by cutting off their food and water. “A little water dribbled through, so there is enough to drink, but not enough to flush toilets." With no water for months, where do you relieve yourself? In the street? No, Strauss said. "It was unfriendly to Jews." “What do you do?" he asked the students, than answered that people packed into apartments relieved themselves on balconies, trying not to smear themselves with human waste that had already mounted there over time. Modesty was a luxury none could afford. Today, he said, we know we statistics. We know people died. But we don’t understand how horrible things were. Strauss was liberated by the Soviet army at the age of 14. He and his family followed the Soviets as they fought their way to Czechoslovakia, where they met American troops. By the time he was 16, he was in the United States. He has written four books, including two biographical novels that are available on Amazon.com. Kruus said she’s grateful to Strauss for sharing his experiences. "I know that he has to re-live this very painful event every time he speaks of the Holocaust," she said. "However, because of his generosity of spirit and sense of forgiveness, his lessons are even more valuable to the impressionable young people in his audience than just a story of survival. He and his indomitable spirit are a story of triumph of the human soul." New students and those who have not been assigned academic advisors are being helped by the Counseling staff now. Returning students should seek assistance selecting courses from their academic advisors. Contact information for your advisor can be found in your myGCC Student Center. Please set up an appointment convenient for you. he Welcome Center has dedicated computer stations at most locations with instructions on how to register. This will help you get comfortable navigating your myGCC account so that in the future you can register online when it is convenient for you. Welcome Center staff at the Fredericksburg and Locust Grove campuses ,as well as the Daniel Technology Center, are ready to assist you. You may also find the Quick Guide to myGCC helpful. When you register for classes, please note the new location abbreviations listed by county. Summer course payment is due upon registration. The Office of Financial Aid is still welcoming applications for summer aid and a new summer payment plan is now available. Summer aid should be in place before you register for classes. For those students interested in the payment plan, please click here: Payment Plan. Payment for Fall classes is due by July 17, 2014. Students who filed the 2014-15 FAFSA should register now and verify their financial aid award before the July payment deadline to confirm that aid will cover tuition expenses. Fall payment plan information will be available soon. Students with an outstanding tuition balance on July 17th will be dropped from their classes for non-payment. A record $150,000 was raised at the 20th Annual Germanna Community College Educational Foundation Scholarship Monte Carlo Night Saturday night at GCC’s Daniel Technology Center in Culpeper. for Scholarship Monte Carlo Night. The event has raised over $1 million over time for scholarships for local students. All proceeds go to the Germanna Guarantee Program, which helps students with financial need make up gaps left by financial aid in order to allow them to continue their educations. 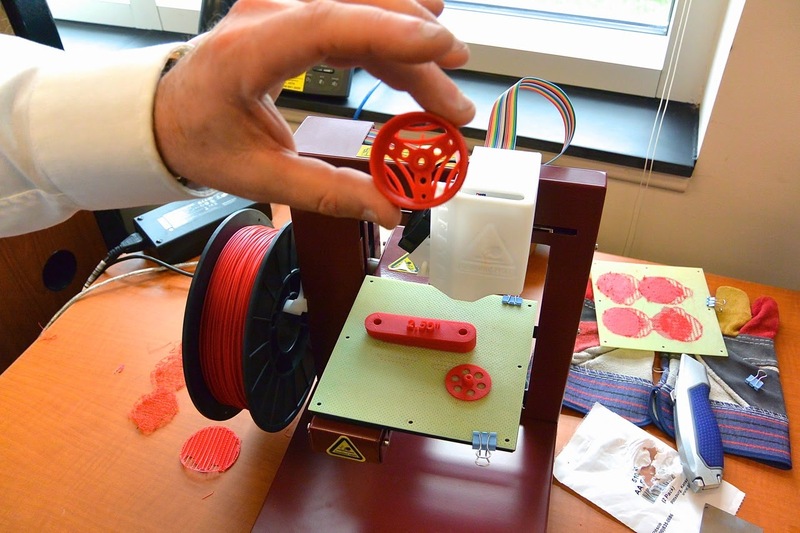 A group of middle school-aged Boys & Girls Club of Central Virginia members learned a little bit about engineering and a lot about the importance of teamwork this week at Germanna Community College’s Daniel Technology Center in Culpeper. 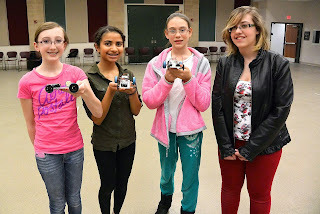 Funding by the Germanna Community College Educational Foundation allowed 20 Boys & Girls Club members from Orange and Madison counties to spend their spring break designing, building and racing electric toy cars using parts created on the spot with a 3D printer. Beaudet, Hannah Smith, Sara Sabine and Jerica Cropp. At a time when a national effort is underway to interest girls in STEM (science, technology,engineering and math) careers, the winning team was all female. 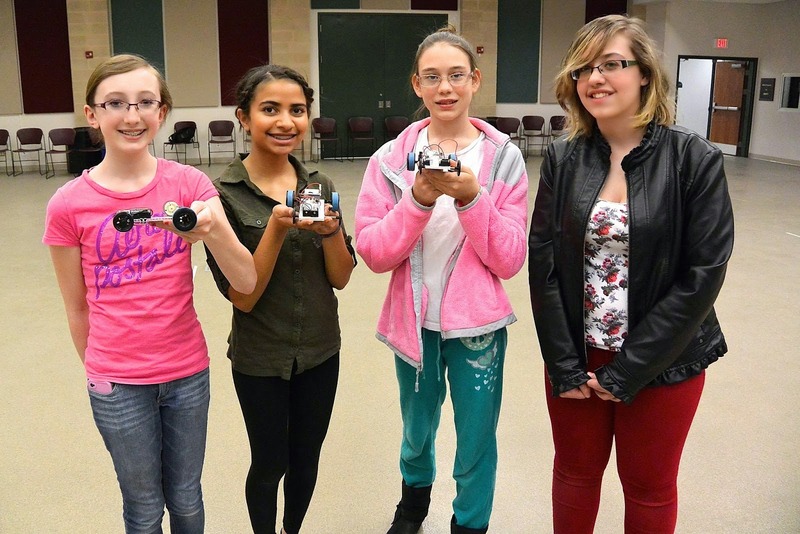 In a display of STEM girl power, it consisted of Brittany Beaudet and Hannah Smith of Orange and Sara Sabine and Jerica Cropp of Madison County. Ben Sherman, a Daniel Center-based Business and Career Coordinator for Germanna’s Center for Workforce and Community Education, asked the Boys & Girls Club members what they learned. “Make it better than the first time,” one volunteered. “That’s the engineer’s point of view,” Sherman responded. “Teamwork pays off,” a second chimed in. “That’s the key,” Sherman shot back. “Bill Gates from Microsoft didn’t do it all by himself. He had teams that worked together. Francis Delaney of Somerset and Gail Marshall of Rapidan contributed to a GCCEF fund that paid for the Boys & Girls Club of Central Virginia’s week of training. The Boys & Girls Club of Central Virginia covers Greene, Madison, Orange and Albemarle counties.